Photographer Susan Meiselas has dedicated her life to capturing complex, sometimes horrifying, experiences, using her camera as a means of “mediation” between herself and her subjects. She doesn’t try and provide answers to the scenes unfolding before her, but instead poses questions and explores new perspectives. One of her most potent bodies of work centres on the people of Kurdistan in the wake of Saddam Hussein’s genocidal campaign against them in the late 80s – a selection of which is currently on display at The Photographers’ Gallery in London as part of this year’s Deutsche Borse Photography Foundation Prize. Meiselas has been nominated for her first European retrospective, Mediations, which showed at the Jeu de Paume in Paris last year, offering valuable insight into the Magnum photographer’s groundbreaking career – including what is arguably her most formative series, Carnival Strippers, begun in 1973. Carnival Strippers is a radical behind-the-scenes peek into the world of smalltown carnival striptease, taken over the course of three consecutive summers just as the women’s movement was beginning to gain traction. “I think in truth it was really the turning point for me,” Meiselas tells AnOther. “Before that I don’t think I had a vision of what it would mean to be a photographer.” Meiselas was a 24-year-old Harvard graduate working as a photography teacher when she stumbled across the carnival strippers, while tailing touring circus troupes during her summer vacation. “It was an accidental encounter, like so much of my work,” she says. 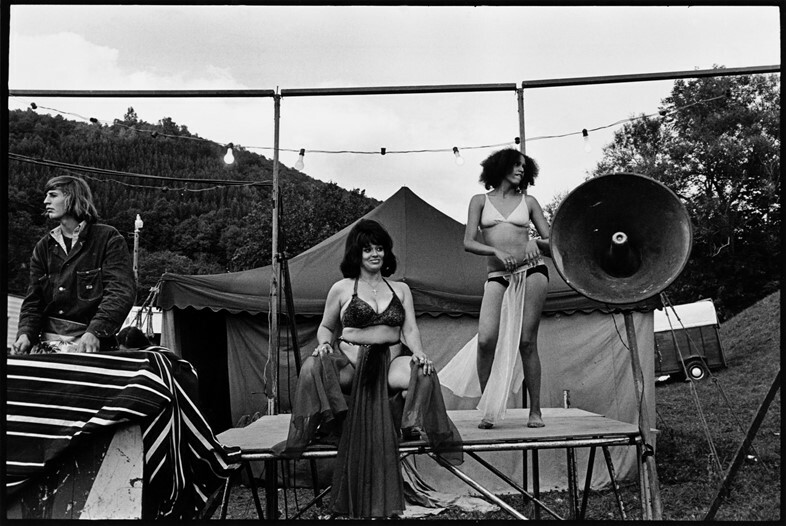 Meiselas was similarly determined to document, visually, the various facets of carnival life for the strippers. There are the shows themselves, of course, where she captures both the viewpoint of the dancers – looking down upon the lustful clusters of men at their (high-heeled) feet – and that of the all-male audience (“no ladies and no babies” at these shows), gazing up at the women’s elongated legs. But Meiselas, who has a knack for befriending her subjects, was also invited backstage by the women to document the hustle and bustle of their changing rooms, their interactions with one another and the mundanity of their lives between shows – the card games, the cigarettes, the endless sitting around. The Deutsche Börse Photography Foundation Prize 2019 exhibition is at The Photographers’ Gallery until June 2, 2019.